USNA Radio Club Communications: For the last 22 years, the USNA Radio Club, W3ADO(the oldest ECA at USNA since 1928), with the help of the AERO Satellite Lab maintains comms and tracking of the runners using the same kind of amateur radio APRS position reporting technology used in the Academy's PCSAT2 satellite on the International Space Station. 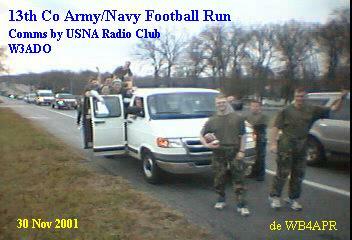 Although the USNA radio club was closed during 2005 in the move to reduce the number of small clubs at the Academy, the small cadre of FCC licensed midshipmen still supported this event in memory of past club president ENS Dan Trembula KG4DRA who just passed away just the week before after his long fight with cancer. This event and Midshipmen Sea Trials are two of the main Brigade support activities for the club. 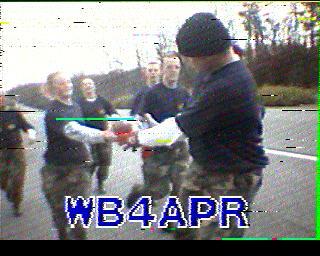 But we got even the next morning on Ball Run day by loading the same bulletin into PCSAT2 also. So not only did we have two satellites saying GO NAVY, but one of them was on his ship! These two links above are to the global Automatic Position Reporting System (APRS)and the FINDU data base maintained entirely by Amateur Radio Operators. We can track over 27,000 ham radio operators worldwide. All you need to know is their callsign and they must have a GPS connected to their HAM radio and these links can find them. The aerial photos are from the USGS Database and the web page overlays the live GPS coordinates on them. ENROUTE This photo was from 2001 as they headed up route 2. The above street maps only show the Football position. The following map ran javAPRS live and showed all amateur radio APRS stations participating or in the vicinity of the Football and Shuttle vehicles. Now this map is running a replay of the 2001 event. When you logged onto this site, you were asked to trust the JAVA applet software that runs this map. If you declined it, then this replay below will not work at this time. 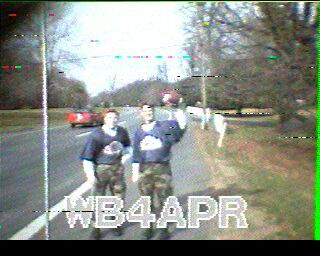 The following section was updated in real time* via amateur radio link whenever new images were received from the lead vehicle. 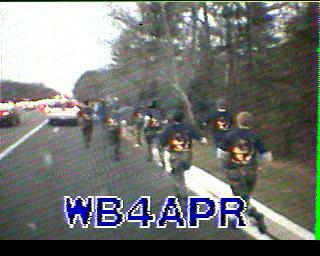 Most images were taken by the handheld Ken-Cam during changes in runners at each of the legs. 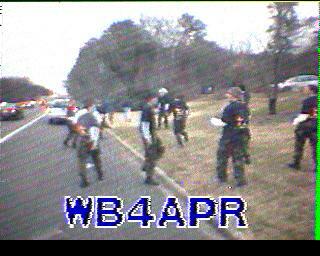 (Also, see 1998's Photos). 1999's Photos). 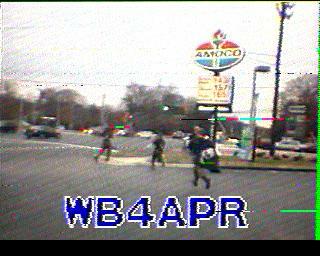 Here are the new photos as they came in via HAM radio:. And here is a picture of the original GPS tracker built into a football helmet. Internet Explorer for some reason, cannot display this counter, but Netscape can. The counter reached 4400 by game time for 2004. .